Erasmus Quellinus II (1607–1678), Jason and the Golden Fleece (1630), oil on canvas, 181 × 195 cm, Museo Nacional del Prado, Madrid. Wikimedia Commons. The seventh book of Ovid’s Metamorphoses starts with a series of myths concerning Jason, Medea, and the Golden Fleece. Although these take up the first half of this book, Ovid only summarises long and complex stories which are told more fully elsewhere. They also present a problem in consistency of theme. For the Metamorphoses to provide reasonably comprehensive coverage of all the major contemporary myths, they are essential. But they lack the transformations which are promised by the title, and which Ovid has so far been able to maintain. Ovid drops us into the story of Jason and the Golden Fleece just as Jason has learned of the three tasks he must complete to obtain the prize. Medea, the daughter of King Aeëtes of Colchis, considers that her father’s demands are too harsh, and as a result feels torn between desire and reason. She recognises that she has fallen in love with Jason, and is already considering wild thoughts of marriage to him. She resolves to provide him with every aid that she can to assist his mission, in the hope that this will ensure their marriage, and secure her future glory. Medea therefore goes to an old shrine to Hecate, where she meets Jason and teaches him how to use magic herbs to accomplish the tasks. The following day, watched by the king, Jason succeeds in the first task of yoking a team of fire-breathing bulls, and using them to plough a field which had never been ploughed before. This is enabled by a herbal ointment provided by Medea. As he is ploughing, Jason sows the teeth of a dragon, required for his second task. As with those sown by Cadmus before he founded the city of Thebes, those teeth instantly grow into an army who point their spears at Jason. Medea told him to throw a large rock into their midst, which draws their attention and they kill one another, instead of Jason. and slowly slumber sealed the dragon’s eyes. Iolcus — victorious with the Argonauts. Despite its sustained popular appeal in other artistic media, the story of Jason and the Golden Fleece has been painted remarkably little. Its best and most complete visual representation remains that painted by the Carraccis around 1583-84 in Bologna, one painting of which I show later. Several artists, notably those of the late nineteenth and early twentieth centuries, have explored the role of Medea, and her relationship with Jason at this stage of the story. 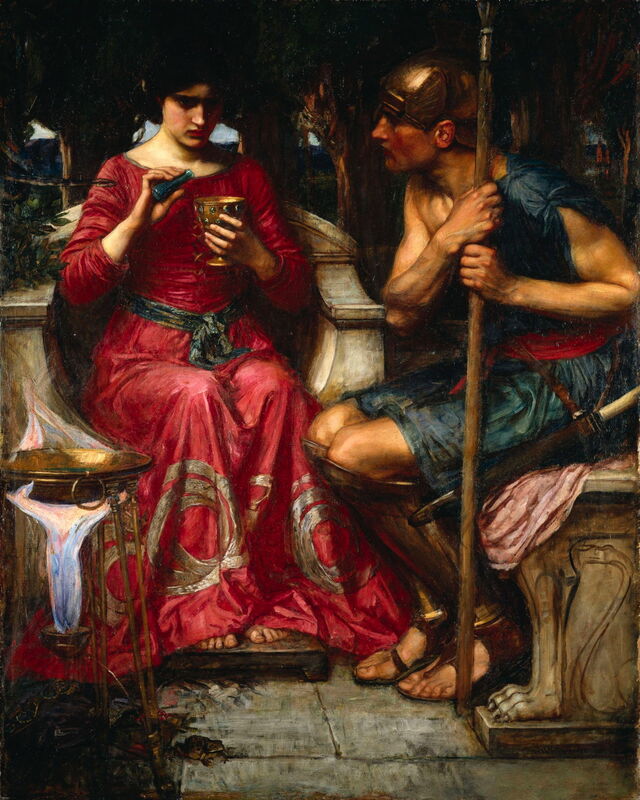 In John William Waterhouse’s Jason and Medea (1907), Medea is depicted as a sorceress, preparing the potions which Jason was about to use to accomplish his tasks. Jason appears anxious, ready to go and tackle his challenge. Several other painters of this period made portraits of Medea alone; these are shown in my previous article. Annibale Carracci (1560–1609) (and Agostino, Ludovico Carracci), Jason and Medea (one painting from 18) (c 1583-84), fresco, dimensions not known, Palazzo Ghisilardi Fava, Bologna, Italy. Image by Sailko, via Wikimedia Commons. The frescoes of the Palazzo Ghisilardi Fava in Bologna give a superb account through eighteen separate images. Although this work was directed by Annibale Carracci, it is thought that his brother Agostino and cousin Ludovico also made significant contributions during the painting, between about 1583-84. This work uses elaborate multiplex narrative to summarise much of Ovid’s account: at the left, two of the fire-breathing bulls are still yoked, in front of King Aeëtes. The army sprung up from the dragon’s teeth appear behind the wall, armed still with spears but no longer fighting. 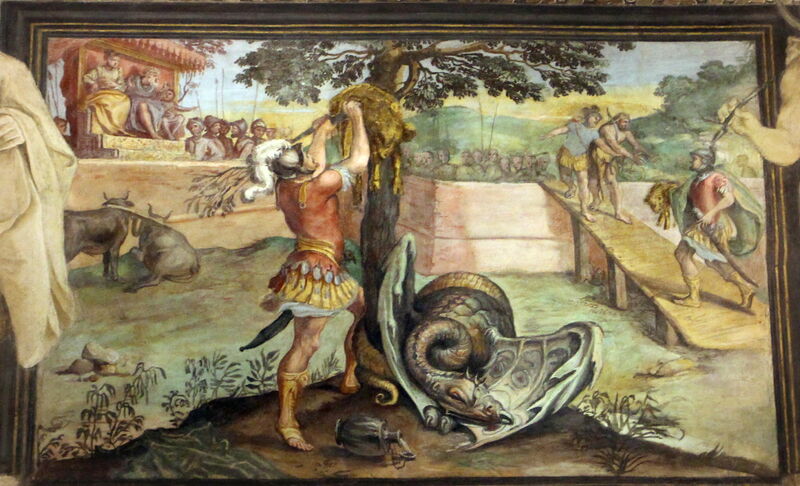 In the foreground, Jason has put the dragon to sleep using Medea’s magic concoction, and is unhitching the Golden Fleece while he can. At the right, two of the Argonauts offer to help Jason (shown a second time) carry the fleece away. Gustave Moreau’s Jason (1865) bizarrely excludes Medea from its title. She stands almost naked behind Jason, holding a vial in her right hand, and her body is swathed with the poisonous hellebore plant, one of the standard tools of witchcraft. It has been suggested that these allude to Jason’s later rejection of Medea and her poisoning of Glauce, but that is not borne out by the only clues which Moreau provides, in the almost illegible inscriptions on the two phylacteries wound around the column. These imply that we should read the painting in terms of the conflict between Jason and Medea: Medea expresses her subjugate trust in him, whilst Jason considers her to be just another spoil won alongside the Golden Fleece. 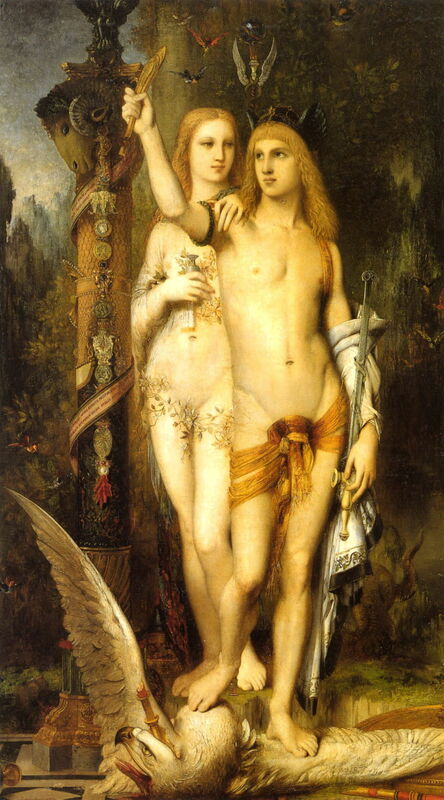 When exhibited at the Salon in 1865, the critics were unsure of what they were supposed to be looking at, and Moreau’s narrative was irretrievable amid his surfeit of symbols. This is the sort of narrative which you would expect Rubens to have painted, and he did prepare some sketches of the motif. 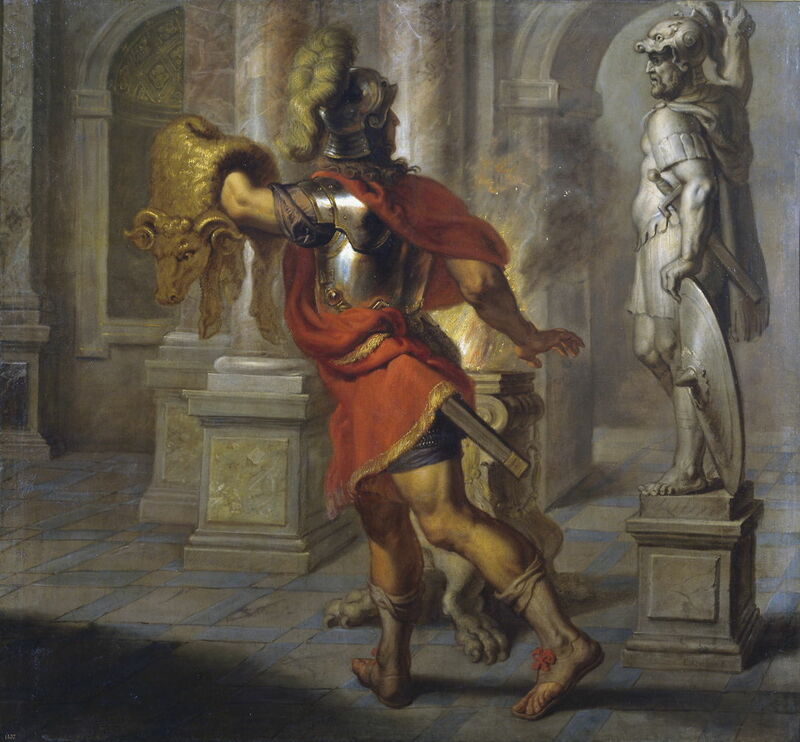 It was his pupil and collaborator Erasmus Quellinus the Younger (1607–1678), though, who produced a finished painting of Jason and the Golden Fleece in 1630, probably within Rubens’ workshop. Following Rubens’ death in 1640, Quellinus went on to become his successor as the Master narrative painter of the day, although his works are far less known now than those of his teacher. Although the later paintings have a certain fascination about them, I feel that they are perhaps contriving to be a little too clever. The story of Jason, Medea, and the Golden Fleece is nowhere told better than in the Carraccis’ original frescoes; sadly images available of them are of limited and variable quality, and do not do justice to the whole cycle, but I hope the one above has whetted your appetite for a visit to Bologna to see them for real. Posted in General, Language, Life, Painting and tagged Carracci, Golden Fleece, Jason, Medea, Metamorphoses, Moreau, myth, narrative, Ovid, painting, Quellinus, Rubens, Waterhouse. Bookmark the permalink.